A dedicated group of parishioners who clean the Upper Church and the Chapel and clean and prepare the Sacred Linens for Mass. Assists parishioners who have lost a loved one. contact Sister Kathleen White at 215-334-0268 for more information. Members are Catholic who are intensely bent on living the interior life deeply and vigorously. A member is zealous for the salvation and sanctification of souls, working for them in every kind of apostolate and corporal work of mercy. She may be found visiting the sick in nursing homes or the hospital. She attends wakes, especially those of Sodality members and attends their funerals. 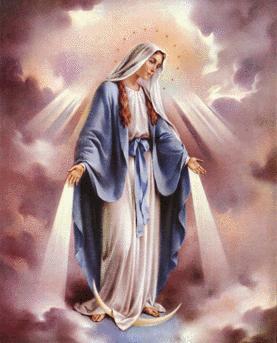 She possesses a deep, sincere and consecrated devotedness to the Blessed Virgin Mary, her Queen, Advocate and Mother and shows it by striving to imitate her splendid virtues; places all her confidence in her and leads others to love and serve her. She sees value, personal and apostolic, of the following rules and lets them shape her way of life and living. She is a frequent and even daily attendee at Mass and Holy Communion and Days of Recollection. She attends meetings when possible and volunteers to take active part in the programs of charitable and apostolic action. She is careful of her Sodality’s good name and seeks to obtain new members for its ranks and is one, in short, who strives to live the Christian way of life as fully as she can. It’s impossible to tell how much this organization can help young people. By being a member of a Sodality, a person is helped by others to be good and to do good. By being a member of a Sodality, a person makes for herself truly good and faithful friends who all have the most important things in common. These kind of friends last. By being a member of a Sodality, a person has frequent occasion for good fun with good people. If you think you would like to join Contact Fr. Mark Kunigonis at the rectory at 215-334-4170. Assist in opening, computing and recording all donations received for the parish. Members meet weekly on a rotating basis. Open to all adult parishioners. Contact Deacon Leonard for information at 215-334-4170. Distribute the Holy Eucharist at parish Masses and to the homebound. Open to all parishioners 18 years of age and over, approval of the pastor required. Contact Deacon Leonard at 215-334-4170 for more information. Directed activities, sports and bonding time for all parish fathers and their sons through high-school age. They sponsor a Family Day, a Christmas Party, Family Picnic & Adult Socials. Meets Friday evenings, September through June in the gym. Contact Phil Marino at 267-251-8339 for more information. Advises the pastor on financial matters. Directed activities, arts and crafts and field trips for all grade-school girls of the parish. Meets Friday evenings in the Ritner Street School Hall, September through May. For information please contact Anita Mariani at 215-389-3071. Assists the holiness of each member, sponsors religious and social activities to benefit the parish and helps the pastor in any way requested. Open to all men and boys of the parish. Holy Name Mass is the Second Sunday of each month, with meetings on the Monday after the Second Sunday, 7:30 pm, September through June. Sponsors the Annual Communion Breakfast in November. Sponsors informative programs, school fundraisers and other activities that link parents, teachers and students of St. Monica School. General body meets five times annually; a subcommittee meets five additional times prior to general meetings to plan upcoming events. Open to all parents/guardians of students who attend St. Monica School. Contact Sister Rita at 215-467-5338 for more information. Read God’s Word at Mass and other Special Liturgies. Open to all parishioners aged 18 and older subject to approval by the pastor. Assists the pastor in an advisory capacity on items of importance to the parish. Teaches the basics of the faith to Catholic children who attend non-Catholic schools. Classes are held on Tuesday afternoons in the Ritner Street School, September through May. Contact Deacon Leonard at 215-334-4170 for more information. Educates and promotes the culture of life for all parishioners. Open to all members of the parish. Members of the Society of St.Vincent de Paul (or “Vincentians” ) are men and women who strive to grow spiritually by offering person-to-person service to individuals in need. We are young and old. Our members come in every shade of skin color. Some of us are wealthy, some are financially poor, but all of us are blessed with an awareness that our blessings (time, talent or treasure) are to be shared with our brothers and sisters in need. We know that we are not alone. We are part of an international society of friends united by a spirit of poverty, humility, and sharing, which is nourished by prayer and reflection, mutually supportive gatherings, and adherence to a basic Rule. The St. Monica Parish Society of St. Vincent de Paul offers tangible assistance to those in need on a person-to-person basis. It is this personalized involvement that makes the work of the Society unique. This aid may take the form of intervention, consultation, or often through direct dollar or in-kind service. An essential precept of the Society’s work is to provide help while conscientiously maintaining the confidentiality and dignity of those who are served. The Society recognizes that it must assume, also, a role of advocacy for those who are defenseless or voiceless. Some 12 million persons are helped annually by Vincentians in the United States. Has directed activities, travel and trips for all seniors, age 55 years and older. Meets in the Ritner Street School Hall Mondays at 1 pm from September through June. Assists the pastor in fund-raising for the parish.